an optical instrument for examining small objects not readily discernible by the naked eye. The object being observed is positioned slightly less than a focal length away from the magnifier. Under these conditions a magnifier provides an upright, magnified virtual optical image of the object. After passing through the magnifier, the rays from the object are again refracted in the eye and are collected at its most remote point. 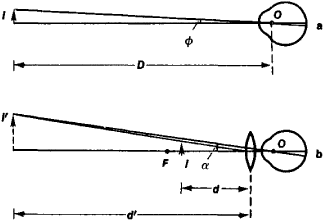 They enter the eye at an angle greater than do the rays from the object without a magnifier; this is the reason for the magnifying effect (see Figure 1). Figure 1. Path of rays when viewing a small object / in a magnifier L The object is positioned in the immediate vicinity of the focal plane OO1, of the magnifier. The rays coming from point S of the object are collected at point S” on the retina of the eye. The rays from point S″ would also be collected at point S” if there were no magnifier (point S’ is the’virtual image of point S). The magnification M is defined as the ratio of the angle α at which the virtual image of the object is seen from the center of the eye’s pupil to the angle at which the same object is seen without the magnifier at the distance of distinct vision D (Figure 2; for the normal human eye, D == 0.25 m). The magnification depends on the focal length f’ of the magnifier (usually expressed in millimeters) according to the ratio M = 250/f; the value of M may range from 2 to 40 or 50, depending on the design of the magnifier. Figure 2. Observation of a small object /. (a) With naked eye at the distance of distinct vision D; 0 is aperture angle of rays from the object that enter the eye. (b) Through a magnifier; rays from the object enter the eye at an angle a > <£; d is the distance from the magnifier to the object, d’ is the distance from the magnifier to the image it forms of the object as seen by an observer. The simplest magnifiers are converging lenses; their magnification is usually low (about 2-3 X). 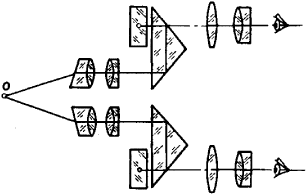 Two-lens and three-lens systems (Figure 3) are used for magnifications of 4-10 X. The field of view of the images in space for magnifiers having low and medium magnification does not exceed 15°-20°. The design of magnifiers having high values of M is similar to that of complicated eyepieces; their field of view reaches an angle of 80°-100°. In a magnifier with high magnification the distance from the object to the surface of the magnifier is very short. This drawback is avoided in telescopic magnifiers (Figure 4), which are capable of observing remote objects with M ~ 2.5 and nearby objects with M ~ 6. Binocular (stereoscopic) magnifiers, a diagram of which is shown in Figure 5, are also in use. Magnifiers are also used to measure linear dimensions. The object to be measured is brought into coincidence with a flat glass or metal scale placed in front of the focal plane of the measuring magnifier (in practical terms it is in the plane). The images of the object and the scale are compared. The magnification of a measuring magnifier is usually 4-16X; the focal length, 10-40 mm; and the scale divisions, 0.1 mm. Such magnifiers are used to measure the width and length of letters and scratches and the distance between points. Bushnell Transition Magnifier Power: 3X Objective: 24mm Tube Diameter: 30mm Elevation Adjustment: . The principle of all plus-lens magnifiers is the same: the magnification remains constant regardless of the eye-to-magnifier distance providing that the object is placed at the anterior focal point. Labourer's who were the majority had telescopes and magnifiers prescribed equally. And also, you can visit our website www(dot)zoomax(dot)co to join our New Year's contest and win a portable video magnifier Mars HD. Scan-and-read programs work like video magnifiers to enlarge print. High-tech solutions for reading books, menus and more: is it hard to read? There may be a fix! Careful measurements of reflectance illumination were made of the most common illuminated stand magnifiers that are on the market. Stamp collectors use magnifiers to see the details of stamps. Electronic magnifiers increase size and also enhance contrast. The wipes can be used on goggles, cameras, lenses and magnifiers to fight fog build-up. The specialists will show people how to use hand- held magnifiers to accomplish daily tasks such as reading a newspaper. The range of items is varied and includes household products such as magnifying mirrors, magnifiers, ergonomic footrests, key holders, jar grippers and openers, tube squeezers, pill crushers and splitters, and bedrails.